You are browsing the archive for extreme heat. 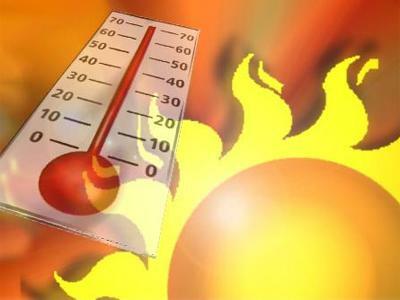 With Monday’s high of 92, Springfield recorded the fiftieth high of ninety-degrees or higher this year! And more may be coming. The table shows the 30 year normal number of days of 90 plus heat by month. 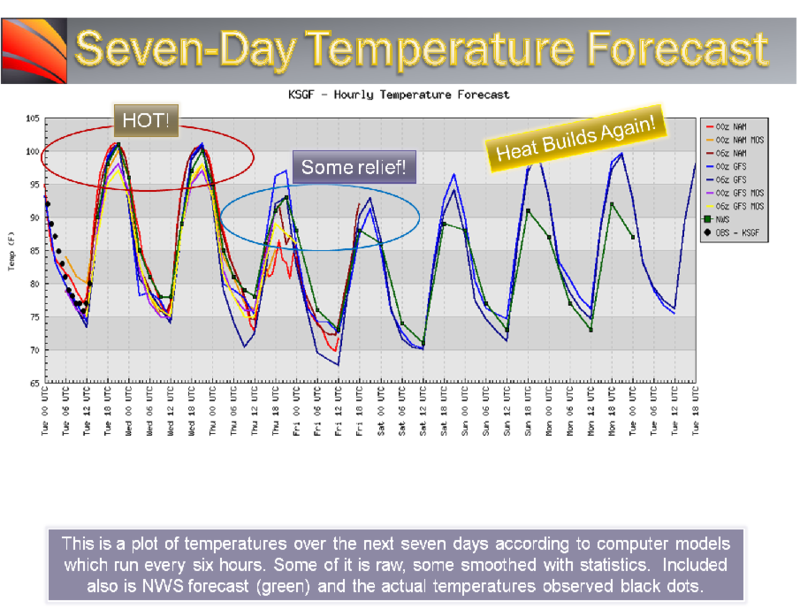 We are still looking like summer (June-August) 2010 will rank in the top ten, somewhere around 6th hottest. The good news is that there are several chances for cool fronts or rain/storm areas to come along and cool us down over the next seven days. The bad news is that we will need cooling down! Temperatures across Missouri today were a tad below normal but pretty hot in northern Arkansas and points south. It’s expected that a return to southerly winds on Thursday will spread the heat into all of the Ozarks. Friday should be pretty hot too but storms should begin to develop over portions of the Ozarks. This should help to keep temperature either even or held back a tad on this day. Some uncertainty in exactly where and how extensive storms will develop Friday night and early Saturday casts a shadow on the confidence of Saturday’s high temperature. It is possible we will have a post rain/cloud cool day similar to this day earlier in the month. I think I will split the difference and put us around ninety Saturday until I can see how storm clusters will play out. Also, the Storm Prediction Center is forecasting a slight risk of severe storms coming as close as eastern Kansas and the Kansas City area. The heat will build back in Sunday through Tuesday. By Wednesday, another front is forecast to move through the Ozarks and give us a fresh supply of cool air! Well, after recording a high of 99 degrees on five different days over the past two weeks, we finally officially topped 100 degrees today reaching to 101. This breaks a record of 100 for this date established in both 2007 and 1936. It’s also the hottest day of the year and the second one hundred degree day of the year. August has been brutal so far! The average high temperature for the first 13 days has been 95.6 degrees! Only two days have been below ninety. 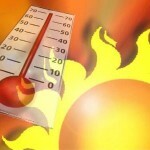 The average low was 73.8 with several mornings at 76 for a minimum temperature. We’ll have one more hot day oin Saturday before a cool front and the slow establishment of a cooler high pressure system starts on Sunday. Unlike last week when the heat was over by Thursday, this week it will continue through Friday. A combination of heat advisories and warnings are in effect officially through Wednesday and may very well be extended. We are well on our way toward 40 days with highs of 90 degrees or higher this summer. 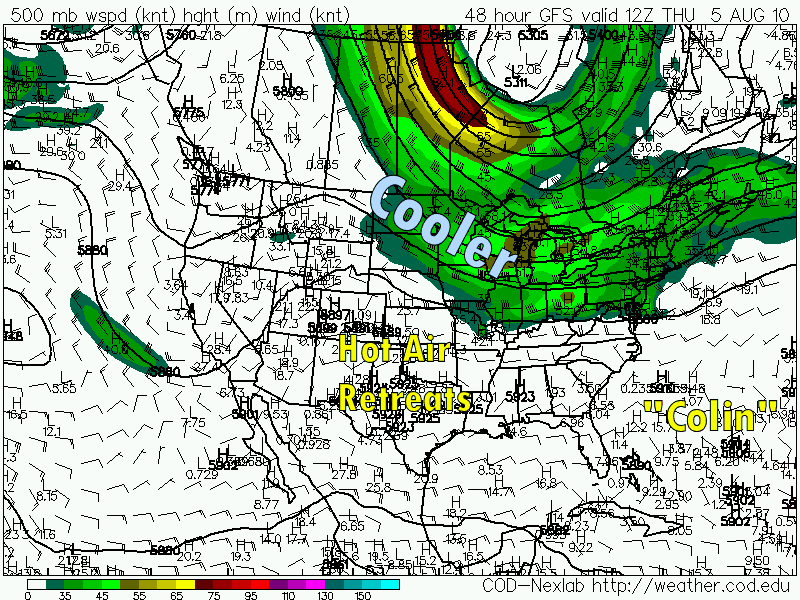 A ridge of high pressure in the upper atmosphere is responsible for our hot weather. 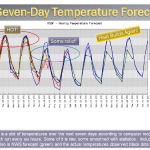 Fore more information on our recent hot weather, please search this blog under the category “extreme weather”. You can also find great information on the Springfield National Weather Service web site under the top stories archive. Please remember your personal limits change in this heat. A level of activity which may be easy for you in normal summer weather will not be in this extreme heat. Also, watch out for those who may not be able to watch out for themselves and this includes pets. There is a change in the weather in the works! You can watch my discussion of an approaching cool front on the morning weather review. Another round of excessive heat is forecast to develop over the Ozarks beginning on Sunday and lasting through at least the first few days of next week. You can watch my twice daily briefings on the weather patterns which will affect the Ozarks on this web site. Follow the “Weather Info” then “Wx Review” menu items above. A ridge of high pressure in the upper atmosphere is responsible for most heat waves. This develops rather naturally over the central U.S. during the summer months as the land mass heats quickly in the strong summer sun. This feature promotes sinking air which not only restricts the hot, humid and unstable air from rising, in actually helps to build the heat as sinking air compresses and heats up. A few things can disrupt heat waves. One, if a small disturbance(s) can find its way into the ridge, then thunderstorms can pop up which can lessen the effects of the heat for some. Also, if the dew points are low for the season the heat index value won’t be as high, thereby lessening the effects of prolonged heat. Case in point: On Monday, we had a high of 100 and the dew points were very high for the season, running in the middle and upper seventies. This was a pretty dangerous condition for the Ozarks. The Heat Index (HI) was exceeding 110 degrees on this day. On Tuesday, the dew points dropped into the sixties over much of the area so with about the same actual temperatures, the HI’s wereonly between 100 and 105. On Wednesday we split the difference a bit, settling somewhere in the middle. This next heat wave may be mitigated a bit by afternoon storms on any day next week. Still, afternoon temperature have the potential to rise into the upper nineties on any of the days. Very Hot, Hot and Very Hot Again! The pattern of weather we are in features a dome of hot air which has advanced over the Ozarks and much of the central U.S. for the first part of this week. An Excessive Heat Warning is in effect through Wednesday early evening through all of the Missouri portion of our viewing area as is in effect also for Thursday for extreme southern Missouri. This pattern will be broken down by a wrinkle in the jet stream flow diving southeast out of Canada through the Great Lake states by later in the week. Interestingly, this feature will be responsible for steering tropical storm “Colin” eastward toward open ocean (or at least holding the system over the western Atlantic for a while). 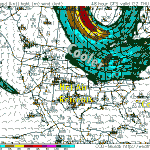 This jet stream change will allow a front to ease into the Ozarks Thursday afternoon. This will have the effect of bringing temperatures down closer to normal values of around ninety during the afternoon through about half of the Ozarks Thursday and all of the area on Friday. But the heat will build back ino the central and eastern U.S. beginning on Saturday. Widespread one hundred degree values will likely be seen on Monday and Tuesday from Missouri and Arkansas eastward to the Atlantic coast.